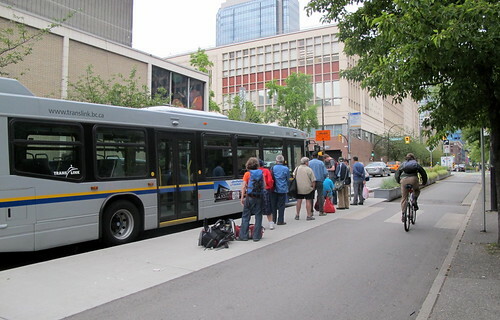 If you commute by bike or bus, the conflict is familiar: a bus will overtake a person bicycling then arrive at a stop to pick up passengers, and while the bus is momentarily stopped the person bicycling will catch up and overtake the bus. 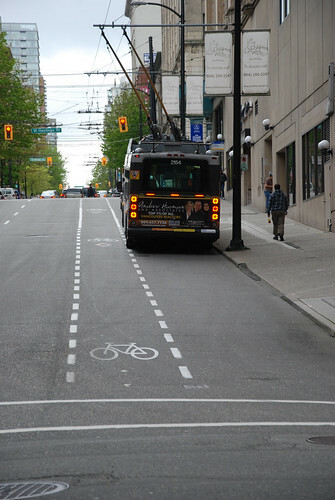 This effectively creates an unwanted game of “leap frog” in which bicycles and buses are constantly overtaking one another, sometimes causing near collisions since it can be difficult to see a bicycle approaching on the left as the bus driver attempts to re-enter the flow of traffic. As if contending with traffic weren’t stressful enough, this repeated negotiation can be exhausting and tense for both parties. Thankfully, there is a solution– routing bicycles to the left of bus stops in a separated lane, known as “bike channel” or “bus bypass.” Here in the Bay Area, San Francisco has pioneered this practice on streets with streetcar stops where it seems to be working just as it should, removing the bus-bike conflict seen on heavily traveled routes throughout the region. So it comes as good news that the practice will soon expand into the East Bay along AC Transit’s 51 route this summer as part of the “Line 51 Corridor Delay Reduction and Sustainability Project.” Not only is this anticipated to remove the common “leap frogging” conflict between buses and bikes, but this is also expected to help speed up bus times too– a win-win! While the proposed orientation (which will look similar to the configuration in the lead photo) is unfamiliar in the East Bay, it certainly is not new. In The Netherlands, transportation planners have separated buses and bicycles at bus stops since as early as the 1950’s. To learn more about how this clever design improves conditions for everyone watch the video.